Day 2 was a little more trying than day 1. Though I didn’t get a headache from no coffee! I figured out that I’m an emotional eater, and that is going to come back to bite me be my biggest challenge. Though I did manage to show restraint and not completely blow it! Now I just need to be more consistent with my workouts. I’ve found that I’m already sleeping better, and by using the schedule that I’m on now, I’m easily getting a full eight hours. I think by continuing on this trend instead of cutting it short to six or seven, the results may be better…but we’ll see – that means that I have to continue to workout in the afternoons. So, dinner last night was fajitas! It’s interesting that Mexican food, in the most traditional, no fluff sense, is the common theme for these meals. Week one had taco salad and enchiladas on the menu, and fajitas was in another week. I think it’s because of the emphasis on vegetables and grilled meats. And not everything has to be covered in a sauce, like in most Tex-Mex restaurants. For my fajitas, I used leftover rotisserie and oven-roasted chicken, cooked everything in grapeseed oil, and added some spices. I served mine over a bed of greens with some of the cilantro lime rice from last night, and Morgan’s was on a tortilla with cheese. It was definitely tough not to have cheese and tortillas with my fajitas, but the flavors were bold enough that I was only missing it a little once I started eating it. Let’s talk about this picture. See that green stuff on top? Looks like some high-fat, you shouldn’t eat that kind of sauce, doesn’t it? Let me tell you…it’s not! It’s paleo, vegan, gluten-free and clean. I found it on Pinterest, which led me to a blog called Feed Me Rachel, while searching for an avocado ranch. It uses avocados and coconut milk, salt, dill, garlic and onion powders and lemon juice to keep it from turning brown. It was pretty delicious and I still have enough for the rest of the week if I wanted to use it! Didn’t taste exactly like a mixture of avocados and buttermilk ranch, but with these fajitas, it didn’t need to! And it took the place of sour cream – since we can’t have dairy on this clean eating challenge. A few people have asked me why in the world I’m avoiding coffee, and what is this clean eating thing I’m doing? I’m happy to tell them that I’m doing it for my health, and if weight loss is a side effect, I won’t complain. That it’s called a challenge for a reason – it’s not meant to be easy, and it challenges the “normal” diet of processed food. It is also challenging what we’re doing that seems healthy, like making small substitutions, and forces us to follow a strict, clean diet – almost in an experimental, “Try it and see what happens” sense. I am also sure to sneak in that I’m using Arbonne products to help me along the way. 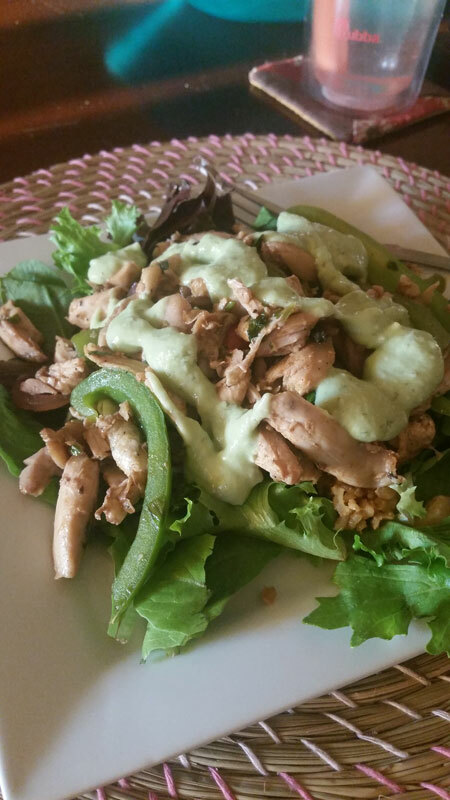 This entry was tagged arbonne, avocado, chicken, clean eating challenge, fajita, ranch, salad. Bookmark the permalink.